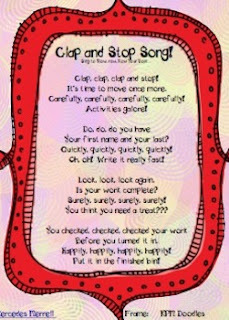 Sing the Clap and Stop Song! to the tune of "Row, Row, Row Your Boat" with your class when time is called for an activity to stop. 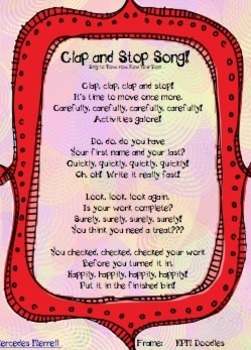 This catchy little ditty will help remind the students to check their work for name, completeness, and to put in the bin. Happily, quickly, surely, and carefully are the repeating words in the song, and they have a pleasing cheerful sound! It can also be used as the signal to stop a center activity if you use rotations in your classroom. I hope you enjoy this FREEBIE!